Well a big thankyou to www.happyhooligans.ca for todays activity it was fab and we had loads of fun recreating this one!! 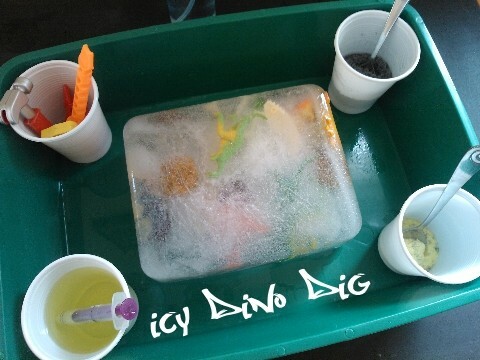 A while back I filled an ice cream tub with water, mini dinos, fossils and stones and left it to freeze. It then stayed in my freezer for aaaaages as the temperature was certainly not ice play recently. Well today the weather was strange humid warm but chilly winds. So we cooled of in the house with this. 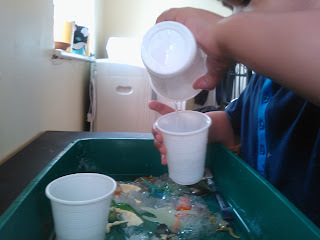 I put some normal salt, some garden salt, and warm water in containers mixing in a lil food colouring as I went. 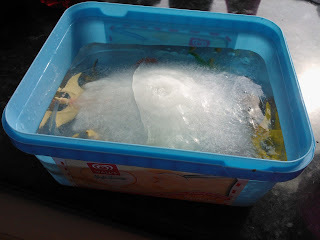 Poured a bit of warm water over the icecream tub and the block of ice just tipped out. I explained that we were going to have a Dino excavation and be paleontologist's. 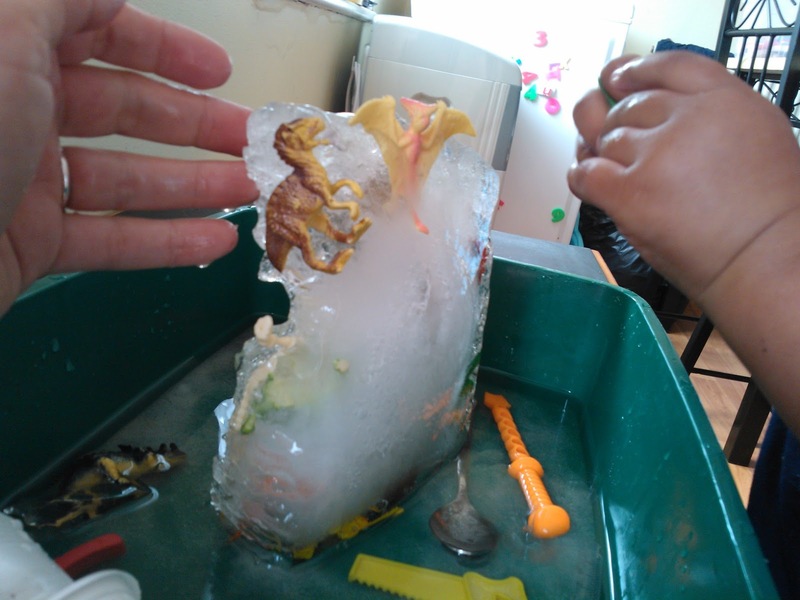 Well lil dude was sold as soon as he saw a Dino spike peaking out and after a quick explanation of how salt and warm water will melt the ice and free the trapped dino's he promptly started scooping salt on. 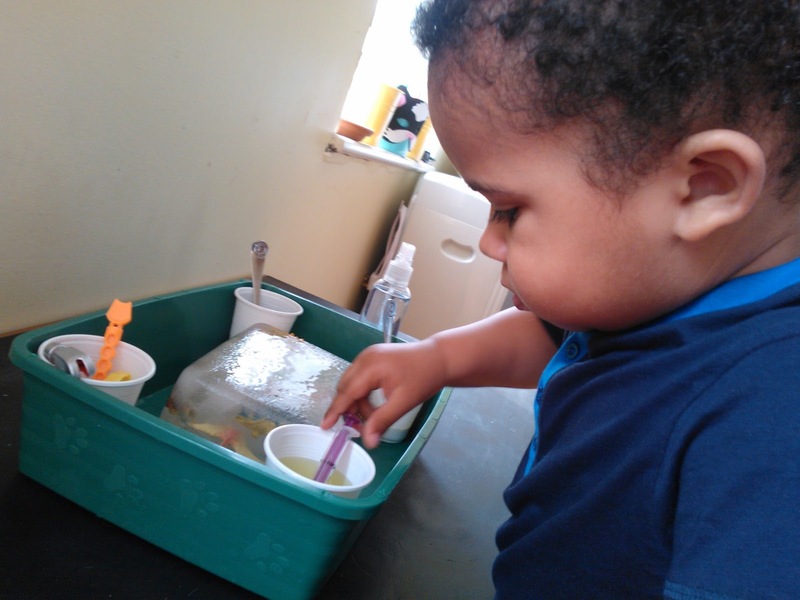 Well he soon realised a spoon full wasn't cutting it so on went the entire cup of salt. I really have to remind myself of his age sometimes my inner perfectionist wants it all to be done carefully while watching each reaction the realist part knows lil dudes limits and to enjoy it thoroughly I have to step back and embrace the chaos! Do you ever find yourself going to correct your kids and having to check yourself because in reality that's how they learn and why should they do it like that anyway because we say so?!? I try to give lil dude the freedom to do things his way to learn from chaos but like I said it goes against my upbringing and includes a fair bit of tongue biting! 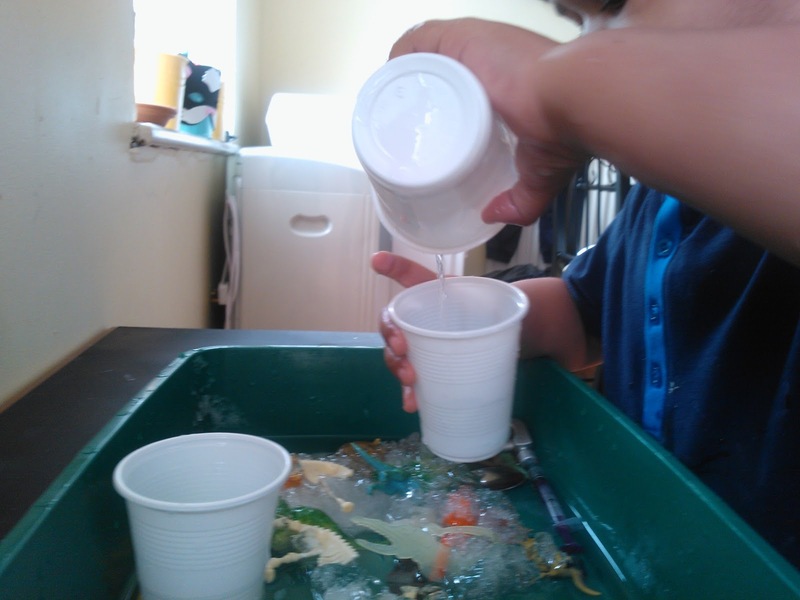 So the poured on salt made some wicked cracking sounds and made a great mess to mix and get lil dudes hands into. 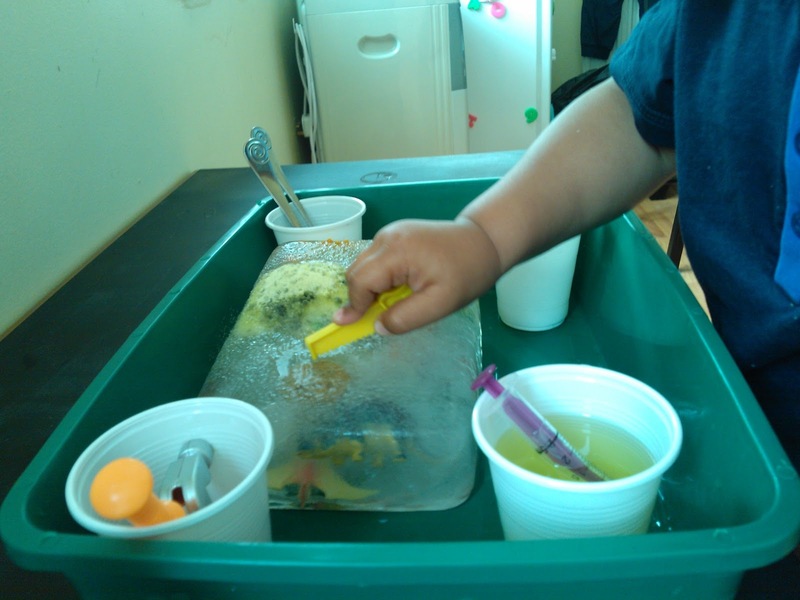 He then used the lil tools I provided to hammer saw and jab (In little hooligans she uses better tools to free but I could see younger lil dude loosing a finger or worse so we limited it to plastic toy tools and teaspoons) he realised the hot water was the best Dino freeing device and sent me running back and forth to the tap. He almost forgot about the poor trapped souls as pouring the water became priority number one! Then back to the digging for a final burst and the were all free!!! 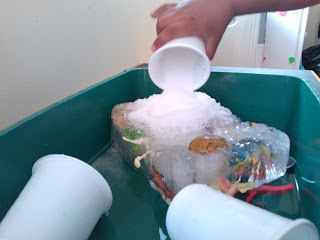 This was a fab activity and will be recreated again I may do a smaller ice block next time as without the proper tools the mass of ice was a challenge to say the least! Minimal clean up and cheap as chips to create! Lil bit of advice if doing inside the garden salt is sharp on lil feet we learnt this the hard way after spilling a bunch on the laminate and as soon as lil dude walked he yelped at they spiked the souls of his little bare feet. There was no injury's but next time I'll keep this one for the garden or at least pop some shoes on him.